Posted on Mon, Aug 13, 2012 : 8:52 a.m. The National Hockey League can cancel the Winter Classic at Michigan Stadium as late as Jan 1., the day of the game, in the event of player lockout, The New York Times reports. The NHL hopes the Winter Classic will beat the attendance record set at the Big Chill in 2010. The agreement between the league and the University of Michigan allows for last-minute cancellation of the game in the event of a work stoppage stemming from lack of a contract, the newspaper reports. Should such a cancellation occur, the University of Michigan would have to refund all but $100,000 of the $3 million rental fee the league is paying, according to the article. The current contract between the league and players expires Sept. 15. 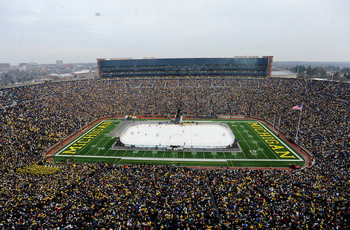 The Winter Classic is scheduled to feature the Detroit Red Wings and Toronto Maple Leafs in a game the NHL hopes will break the world record for hockey attendance, which was set at the Big Chill in 2010 when U-M faced Michigan State University at Michigan Stadium to a crowd of 104,173. The league hopes to pack the Big House with about 115,000 spectators. Tue, Aug 14, 2012 : 2:58 p.m.
What is up with the Alumni games at Comerica Park on the 31st? Will they still go forward as planned? Tue, Aug 14, 2012 : 2:12 p.m.
Getting a same day cancellation notice for an event like this is totally insane. I would think a week's notice would be cutting it short. Just think, the ice rink would be in place, vendors on site, people from Toronto in town. I would suspect if there was a lockout, we'd have a clue about the fate of the whole season in ample time before this event. Tue, Aug 14, 2012 : 10:50 a.m. If there's a lockout this time around, it'll be the supreme greed of the owners. Back in 2005 the owners pushed to get a salary cap, they got what they wanted &amp; the season was cancelled. This time around they want to cut into players even more &amp; make contracts more &quot;owner friendly&quot;. I realize pro atheletes make a lot of money to play sports, but the owners in this situation seems to be overly greedy. The NHL, as little as it is compared to other major sports, has been slowly gaining ground since the last lockout. A lockout this year will crush all that &amp; set them back. Mon, Aug 13, 2012 : 4:42 p.m. I'm sure this gives great comfort to local bars and restaurants who order everything they need the day of a big event. When did critical thinking regarding the big picture stop being a valued trait in this country? Tue, Aug 14, 2012 : 12:02 a.m.
Just because the contract says they CAN do something, doesn't mean they will. If the NHL were to cxl the game they would do it long before January 1. Here is a hint to bar owners. If no games have been played during the season, do not expect the Winter Classic to happen. The game thhey would NEVER want to CXL would be the Winter Classic The clause is in there for negotiations until the last minute if the season was not happening,and they want to make that opening day or something similar. Mon, Aug 13, 2012 : 4:35 p.m. I wonder if the $100,000 covers any expenses incurred to that point? Who decides how many hotdogs to order if there is still a lockout on December 15? Mon, Aug 13, 2012 : 3:22 p.m.
Mon, Aug 13, 2012 : 3:16 p.m. There was a lockout? I had not noticed. I'll bet the dentists really missed the business. Mon, Aug 13, 2012 : 2:53 p.m.
Tue, Aug 14, 2012 : 12:23 p.m.
Yeah, johnny, I have no clue. I am surrounded by sports fans, many of whom used to be NHL fans - including me - and aren't anymore because of that lockout, and many of whom used to be NBA fans - including one in my home - but aren't anymore because of the lack of the problem that past season. But I don't know what I'm talking about, donchaknow. I don't see in those numbers you posted where it indicates any stats particularly for the people known by me. Mon, Aug 13, 2012 : 11:59 p.m. I guess if nobody YOU know talks about it, it must not be happening. Of course, the facts prove that you have no clue what you are talking about http://tvbythenumbers.zap2it.com/2012/06/15/2012-nba-finals-game-2-tv-ratings-up-9-viewership-up-8-vs-last-season/138346/ Ratings equals dollars. Mon, Aug 13, 2012 : 3:47 p.m. I have no tolerance for whining millionaires, whether owners or players. Shut up and play. Mon, Aug 13, 2012 : 3:09 p.m.
NHL hockey players took major concessions last time to save the league, the owners profited,the players will want a raise.